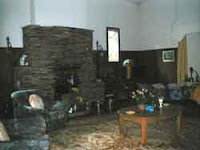 This is a view of the drawing room in the Glendale House. I have often felt a presence here - more especially around this fireplace. The chair on the left was often moved at night. We stayed in a guest room off the living area and could hear the sound of the heavy chair being dragged across the room. Sure enough the following morning it had been moved.